Tyrosinase is an oxidase that is the rate-limiting enzyme for controlling the production of melanin. The enzyme is mainly involved in two distinct reactions of melanin synthesis; firstly, the hydroxylation of a monophenol and secondly, the conversion of an o-diphenol to the corresponding o-quinone. o-Quinone undergoes several reactions to eventually form melanin. Tyrosinase is a copper-containing enzyme present in plant and animal tissues that catalyzes the production of melanin and other pigments from tyrosine by oxidation, as in the blackening of a peeled or sliced potato exposed to air. It is found inside melanosomes which are synthesised in the skin melanocytes. In humans, the tyrosinase enzyme is encoded by the TYR gene. A mutation in the tyrosinase gene resulting in impaired tyrosinase production leads to type I oculocutaneous albinism, a hereditary disorder that affects one in every 20,000 people. Tyrosinase activity is very important. If uncontrolled during melanoma, it results in increased melanin synthesis. Decreasing tyrosinase activity has been targeted for the betterment or prevention of conditions related to the hyperpigmentation of the skin, such as melasma and age spots. Several polyphenols, including flavonoids or stilbenoid, substrate analogues, free radical scavengers, and copper chelators, have been known to inhibit tyrosinase. Henceforth, the medical and cosmetic industries are focusing research on tyrosinase inhibitors to treat skin disorders. In food industry, tyrosinase inhibition is desired as tyrosinase catalyzes the oxidation of phenolic compounds found in fruits and vegetables into quinones, which gives an undesirable taste and color and also decreases the availability of certain essential amino acids as well as the digestibility of the products. As such, highly effective tyrosinase inhibitors are also needed in agriculture and the food industry. Well known tyrosinase inhibitors include kojic acid, tropolone, coumarins, vanillic acid, vanillin, and vanillic alcohol. Tyrosinase has a wide range of functions in insects, including wound healing, sclerotization, melanin synthesis and parasite encapsulation. As a result, it is an important enzyme as it is the defensive mechanism of insects. Some insecticides are aimed to inhibit tyrosinase. Tyrosinase carries out the oxidation of phenols such as tyrosine and dopamine using dioxygen (O2). In the presence of catechol, benzoquinone is formed (see reaction below). Hydrogens removed from catechol combine with oxygen to form water. The substrate specificity becomes dramatically restricted in mammalian tyrosinase which uses only L-form of tyrosine or DOPA as substrates, and has restricted requirement for L-DOPA as cofactor. Tyrosinases have been isolated and studied from a wide variety of plant, animal, and fungal species. Tyrosinases from different species are diverse in terms of their structural properties, tissue distribution, and cellular location. 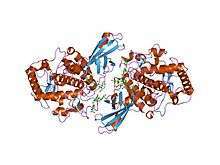 No common tyrosinase protein structure occurring across all species has been found. The enzymes found in plant, animal, and fungal tissue frequently differ with respect to their primary structure, size, glycosylation pattern, and activation characteristics. However, all tyrosinases have in common a binuclear, type 3 copper centre within their active sites. Here, two copper atoms are each coordinated with three histidine residues. Human tyrosinase is a single membrane-spanning transmembrane protein. In humans, tyrosinase is sorted into melanosomes and the catalytically active domain of the protein resides within melanosomes. Only a small, enzymatically inessential part of the protein extends into the cytoplasm of the melanocyte. As opposed to fungal tyrosinase, human tyrosinase is a membrane-bound glycoprotein and has 13% carbohydrate content. The derived TYR allele (rs2733832) is associated with lighter skin pigmentation in human populations. It is most common in Europe, but is also found at lower, moderate frequencies in Central Asia, the Middle East, North Africa, and among the San and Mbuti Pygmies. 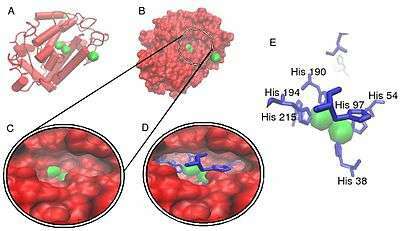 Crystallographic structure of a Streptomyces-derived tyrosinase in complex with a so-called "caddie protein" In all models, only the tyrosinase molecule is shown, copper atoms are shown in green and the molecular surface is shown in red. In models D and E, histidine amino acids are shown as a blue line representation. From model E, each copper atom within the active site is indeed complexed with three histidine residues, forming a type 3 copper center. From models C and D, the active site for this protein can be seen to sit within a pillus formed on the molecular surface of the molecule. The two copper atoms within the active site of tyrosinase enzymes interact with dioxygen to form a highly reactive chemical intermediate that then oxidizes the substrate. The activity of tyrosinase is similar to catechol oxidase, a related class of copper oxidase. Tyrosinases and catechol oxidases are collectively termed polyphenol oxidases. The gene for tyrosinase is regulated by the microphthalmia-associated transcription factor (MITF). ↑ "Diseases that are genetically associated with TYR view/edit references on wikidata". 1 2 Kumar CM, Sathisha UV, Dharmesh S, Rao AG, Singh SA (Mar 2011). "Interaction of sesamol (3,4-methylenedioxyphenol) with tyrosinase and its effect on melanin synthesis". Biochimie. 93 (3): 562–9. doi:10.1016/j.biochi.2010.11.014. PMID 21144881. ↑ Barton DE, Kwon BS, Francke U (Jul 1988). "Human tyrosinase gene, mapped to chromosome 11 (q14----q21), defines second region of homology with mouse chromosome 7". Genomics. 3 (1): 17–24. doi:10.1016/0888-7543(88)90153-X. PMID 3146546. ↑ Witkop CJ (Oct 1979). "Albinism: hematologic-storage disease, susceptibility to skin cancer, and optic neuronal defects shared in all types of oculocutaneous and ocular albinism". The Alabama Journal of Medical Sciences. 16 (4): 327–30. PMID 546241. ↑ Ando H, Kondoh H, Ichihashi M, Hearing VJ (Apr 2007). "Approaches to identify inhibitors of melanin biosynthesis via the quality control of tyrosinase". The Journal of Investigative Dermatology. 127 (4): 751–61. doi:10.1038/sj.jid.5700683. ↑ Chang TS (Jun 2009). "An updated review of tyrosinase inhibitors". International Journal of Molecular Sciences. 10 (6): 2440–75. doi:10.3390/ijms10062440. PMC 2705500 . PMID 19582213. 1 2 3 Kim YJ, Uyama H (Aug 2005). "Tyrosinase inhibitors from natural and synthetic sources: structure, inhibition mechanism and perspective for the future". Cellular and Molecular Life Sciences. 62 (15): 1707–23. doi:10.1007/s00018-005-5054-y. PMID 15968468. ↑ Mendes E, Perry Mde J, Francisco AP (May 2014). "Design and discovery of mushroom tyrosinase inhibitors and their therapeutic applications". Expert Opinion on Drug Discovery. 9 (5): 533–54. doi:10.1517/17460441.2014.907789. PMID 24708040. ↑ Rescigno A, Sollai F, Pisu B, Rinaldi A, Sanjust E (Aug 2002). "Tyrosinase inhibition: general and applied aspects". Journal of Enzyme Inhibition and Medicinal Chemistry. 17 (4): 207–18. doi:10.1080/14756360210000010923. PMID 12530473. ↑ Sollai, Francesca; Zucca, Paolo; Sanjust, Enrico; Steri, Daniela; Rescigno, Antonio (2008). "Umbelliferone and Esculetin: Inhibitors or Substrates for Polyphenol Oxidases?". Biological & Pharmaceutical Bulletin. 31 (12): 2187–2193. doi:10.1248/bpb.31.2187. ↑ Rescigno A, Casañola-Martin GM, Sanjust E, Zucca P, Marrero-Ponce Y (Mar 2011). "Vanilloid derivatives as tyrosinase inhibitors driven by virtual screening-based QSAR models". Drug Testing and Analysis. 3 (3): 176–81. doi:10.1002/dta.187. PMID 21125547. ↑ Hearing VJ, Ekel TM, Montague PM, Nicholson JM (Feb 1980). "Mammalin tyrosinase. Stoichiometry and measurement of reaction products". Biochimica et Biophysica Acta. 611 (2): 251–68. doi:10.1016/0005-2744(80)90061-3. PMID 6766744. ↑ Mayer AM (Nov 2006). "Polyphenol oxidases in plants and fungi: going places? A review". Phytochemistry. 67 (21): 2318–31. doi:10.1016/j.phytochem.2006.08.006. PMID 16973188. ↑ Jaenicke E, Decker H (Apr 2003). "Tyrosinases from crustaceans form hexamers". The Biochemical Journal. 371 (Pt 2): 515–23. doi:10.1042/BJ20021058. PMC 1223273 . PMID 12466021. ↑ Kwon BS, Haq AK, Pomerantz SH, Halaban R (Nov 1987). "Isolation and sequence of a cDNA clone for human tyrosinase that maps at the mouse c-albino locus". Proceedings of the National Academy of Sciences of the United States of America. 84 (21): 7473–7. doi:10.1073/pnas.84.21.7473. PMC 299318 . PMID 2823263. ↑ Theos AC, Tenza D, Martina JA, Hurbain I, Peden AA, Sviderskaya EV, Stewart A, Robinson MS, Bennett DC, Cutler DF, Bonifacino JS, Marks MS, Raposo G (Nov 2005). "Functions of adaptor protein (AP)-3 and AP-1 in tyrosinase sorting from endosomes to melanosomes". Molecular Biology of the Cell. 16 (11): 5356–72. doi:10.1091/mbc.E05-07-0626. PMC 1266432 . PMID 16162817. ↑ "Allele Frequency For Polymorphic Site: rs2733832". ALFRED. Retrieved 23 June 2016. ↑ PDB: 1WX3​; Matoba Y, Kumagai T, Yamamoto A, Yoshitsu H, Sugiyama M (2006). "Crystallographic evidence that the dinuclear copper center of tyrosinase is flexible during catalysis". J. Biol. Chem. 281 (13): 8981–8990. doi:10.1074/jbc.M509785200. PMID 16436386. ↑ Hou L, Panthier JJ, Arnheiter H (Dec 2000). "Signaling and transcriptional regulation in the neural crest-derived melanocyte lineage: interactions between KIT and MITF". Development. 127 (24): 5379–89. PMID 11076759. ↑ Hoek KS, Schlegel NC, Eichhoff OM, Widmer DS, Praetorius C, Einarsson SO, Valgeirsdottir S, Bergsteinsdottir K, Schepsky A, Dummer R, Steingrimsson E (Dec 2008). "Novel MITF targets identified using a two-step DNA microarray strategy". Pigment Cell & Melanoma Research. 21 (6): 665–76. doi:10.1111/j.1755-148X.2008.00505.x. PMID 19067971.